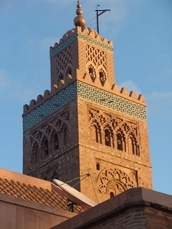 The central square of Marrakech. It is fantastic, especially in the evening. Smoke rises up from the dozens of food stalls which all offer beautiful piles of vegetables, merguez sausages, kebabs, tagines and more. The cooks will call to you as you walk by, but take your time as you’re protected by the watchful eye of the tourist police. When you’ve chosen, sit down and watch as they theatrically pour out mint tea for you. Bread and sauces are provided. Point out what you want cooked, and then prepare to be defeated. About £5 for much more than two people can eat. In the daytime fresh juices are on offer. Orange for about 10p, mandarin/clementine for 20p. The medina offers everything, from dried rose petals to the thuya wood ornaments, and sweets,but was the only place where I was groped and pestered. And down the road from Djemaa el Fna (the Koutobia Mosque side) is a lovely hammam. Segregated times (so men go in the morning, and women in the afternoon). From Koutobia cross the main road as if you are going to Djemaa el Fna. Take the narrow side road, and follow it down. About 500m down on your left is the hammam. A very cheap, very interesting and relaxing experience. 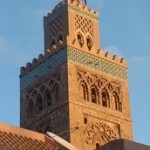 The centre of Marrakech – you can’t miss it. About Us | Links | Contact us | Log in | Entries (RSS) | Comments (RSS) 53 queries. 0.609 seconds.